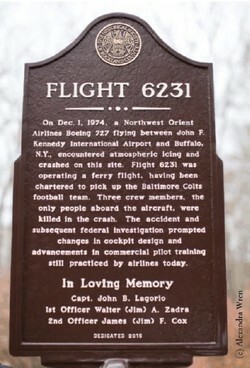 Northwest Airlines Flight 6231 crashed in Harriman State Park on December 1, 1974, just minutes after taking off from Kennedy Airport, on its way to Buffalo. The HSRC and the Historical Society of the Palisades Interstate Park Region invite you to hike to the 1974 commercial plane crash site. The hike is approximately two miles (one mile in and one mile out). It is an easy to moderate hike over gently rolling terrain. Sturdy footwear is recommended due to some rocky terrain. A short lecture will take place at the site. Please note that those who choose not to hike to the site can follow other vehicles to a camp road located within a few hundred yards of the site. Be sure to bring water and wear appropriate footwear and outerwear for this hike. Cancellation policy: Due to the overwhelming popularity of the Hikes through History, the $5 registration fee is non-refundable (unless the program is canceled for any reason by the HSRC). Space is limited for safety. A waiting list will be compiled, and spaces that become available will be filled on a first come, first served basis. Only those who have made full payment can be accommodated.